The two faces of the UR22. Steinberg has unveiled its latest audio interface, the UR22. A 2-in/2-out device, it offers 24-bit/192kHz operation, two combo inputs and MIDI I/O. The front panel also includes a headphones output with its own volume control, plus a master output volume control. The UR22's chassis, meanwhile, is metal, while purchasers can download Cubase AI, a cutdown version of Steinberg's DAW, for free. Find out more below. The UR22 will be available in February priced at €149. Steinberg Media Technologies GmbH today announced the upcoming release of their latest audio interface. The UR22 features 192 kHz audio quality, USB 2.0 connectivity, MIDI input/output alongside two combo inputs with D-PRE microphone preamps and line outputs. Its portable size and solid build make it the perfect choice for mobile setups and small-spaced recording studios. "Together with Yamaha, we aimed at designing a compact audio interface with sufficient connectivity plus a build and audio quality that will simply blow you away. The UR22 is the result of this development. And by combining the UR22 with the Cubase AI music production software you get an eminently professional recording environment at an affordable price," commented Stefan Schreiber, hardware product marketing manager at Steinberg. 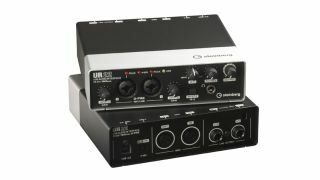 On the front side of the UR22 interface, two Neutrik combo connectors provide microphone and line input, each with gain control and peak indicators plus an additional high-impedance switch on the second input. The panel also includes a headphones output with a dedicated volume control, a master output volume control and a mix knob for hardware-based zero-latency monitoring. The rear panel features two balanced line outputs, MIDI input/output connectors, a phantom power switch enabling +48 Volt supply on both channels and the USB 2.0 port for high-speed connectivity to PCs and Mac computers. The UR22's full-metal chassis houses studio-grade converters, delivering pristine sonic fidelity with a maximum sample rate of 192 kHz and a 24-bit resolution. Yamaha's discrete Class-A analog D-PRE preamps ensure unprecedented sound quality on top of the stable gain required by microphone signals. Freely available as download to all UR22 customers, Cubase AI provides a comprehensive set of tools for recording, mixing and editing audio. The UR22 is compatible with other major recording software applications and includes drivers for Windows and OS X systems. The UR22 interface will be available from resellers and through the Steinberg Online Shop from the beginning of February. The suggested retail price for the UR22 is 149 euros, including German VAT.